Wake to your recording: I wanted to wake up to one of my own recordings that I make with the device's built-in microphone. 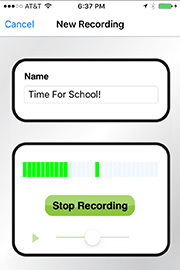 Other apps can only save one custom recording, but this app lets you build your own library of recordings, and then plays your selected recording in a loop until you wake up. 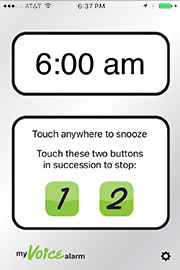 Snooze/off control: I needed more distinction between the Snooze and Stop buttons when the alarm goes off. 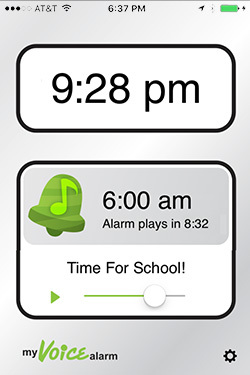 Most apps display two big buttons on the screen, so it's easy to turn the alarm off before you're really awake. This app makes the whole screen a Snooze button (easy to press) and makes the Stop button a two-step process (hard to press accidentally). 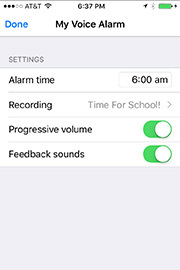 Progressive volume: The volume of my recordings might vary, and the background noise around my house also varies, so other alarms sometimes don't play loudly enough to wake me up. This app includes a volume test button right on the main screen, to compensate for different recording volumes, and an option to increase the alarm volume every minute, in case the background noise in the house is louder when I wake up than it is when I go to bed. Fast time entry: You can enter your alarm time by typing in a number, which is usually faster than the scrolling wheel that other alarm clocks use. Short snooze: When your alarm is playing, you can tap the screen for a normal 9-minute snooze, or double-tap it for a 3-minute "short snooze" -- perfect for those mornings when you need to get every bit of sleep you can! 24-hour time: If your device is set to use 24-hour time, this app will automatically operate in 24-hour mode as well. However, I also tried to keep the app simple, without a lot of extra features that make it difficult to navigate. So, please send any feedback using the link above, but keep in mind that the app will probably remain focused on the main features listed above. My Voice Alarm will only go off if it's the frontmost app on your device. Switching to another app makes it inactive -- this is determined by the operating system and is beyond my control. You can leave your device running (if it's plugged into a power source), manually lock your device, or let it auto-lock and it will still go off, as long as you left My Voice Alarm in front. If you leave your device running, you'll see the snooze and stop controls when the alarm goes off. If you lock your device or let it auto-lock, you'll hear the alarm, but you'll have to unlock your device before you see the snooze and stop controls. Once the alarm has gone off, your device won't auto-lock while it is snoozing. If it's not plugged into a power source, My Voice Alarm might use up to half of your battery's charge during a full night's sleep. Please be sure you have enough power in your battery if you are not able to plug it in.